Submitted by peter on 26 January, 2008 - 19:54. 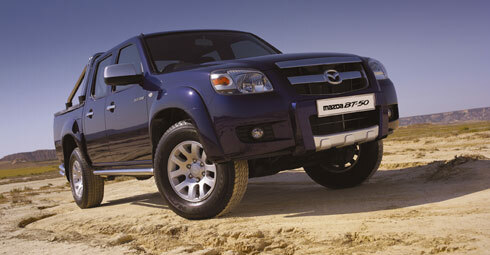 Mazda are currently touring Thailand in a couple of BT-50 pickup trucks. They are going to complete a trip of over 10,000 km to show that the BT-50 can run on the new B2 and B5 fuels with no adverse affects. I'll be interested in seeing the results of this test, even though I think 10,000 km is probably not enough to convince anybody that there are no adverse effects of the fuel. Further, this fuel is 98% and 95% regular diesel anyway. I'd be particularly interested in the fuel consumption figures for the trip. Also, this test will also be equivalent to a Ford Ranger test, since they share the same power units. I would love for this to be a B100 test though, but that will come. Bangkok – Thailand, January 21, 2008 – Mazda Sales (Thailand) Co. Ltd. plans to reinforce its readiness in using alternative energy by organizing a road test of its sports pick up BT-50 around Thailand. Driving a total of over 10,000 kilometers, the two vehicles will use bio-diesel B2 and B5 throughout the road test. This is to support the government's policy in encouraging Thais to turn to use alternative fuel in order to conserve the environment and reduce global warming. John Ray, Managing Director of Mazda Sales (Thailand) Co., Ltd. revealed, " As part of our alternative energy project, we will use two Mazda sport pick-up BT-50 – one with a 2500cc engine with 143 horsepower and the other with a 3,000 cc engine with 156 horsepower – for a test drive. This is to prove that all Mazda BT-50 can use bio-diesel without any side effects on the engine in terms of performance and wear and tear. In addition, we know that it will prove that the use of bio-diesel will result in more economical fuel consumption, and, in turn, encourage owners to utilize more bio-diesel in order to support the government's alternative energy policy. This road test will be conducted by professional race drivers of both racing and cross-country to prove that bio-diesel can be used in our daily lives". While the Mazda BT-50 with a 2500cc engine will be filled up with bio-diesel B2, the other BT-50 3000cc engine will utilize bio-diesel B5. This road test will be conducted in 2 parts, Pete Tongchua and his team who will leave Bangkok for the South of Thailand, then heading North, Northeast and East prior to returning to Bangkok. The total distance will be over 10,000 kilometers with a pit stop at every 5,000 kilometers to check the engines for evaluation and other findings to be compiled for the final test results. Bio-diesel is a kind of fuel that is made of or original or used vegetable oil and animal fat such as from palm, coconuts, Soya beans or sun flower seeds. This extracted oil will consist of Transesterification with Methanol or Ethanol in order to produce Ester, which has properties very much like diesel petrol. This is called Bio-diesel (B100); which was mixed with diesel petrol by 2 % will become B2. And when it is mixed by 5 %, it will be B5. Both can be utilized by diesel engines with no need of any engine modifications. Hoist vehicles to conduct overall check such as oil filter parts, engine oil, piston rings etc.